Vice President Mike Pence is calling for states to decide whether they keep their Confederate statues or not and that’s the way it should be. He chastised the left by warning them about erasing history and he said he actually thought more monuments should be built to honor those who have helped the US. Pence was in South and Central America when the Charlottesville riot occurred. He cut his trip short and came home. That’s the sign of a true leader. Pence believes we should honor our history and heritage and also honor those that are helping the US to become even better. They tend to get lost in the shuffle of politics and soundbites on social media. Pence says that he is “someone who believes in more monuments, not less monuments.” His words reverberate and ring true as Democrat House Minority Leader Nancy Pelosi is demanding that certain statues of Confederate figures that are currently housed in statuary hall in the Capitol be removed. 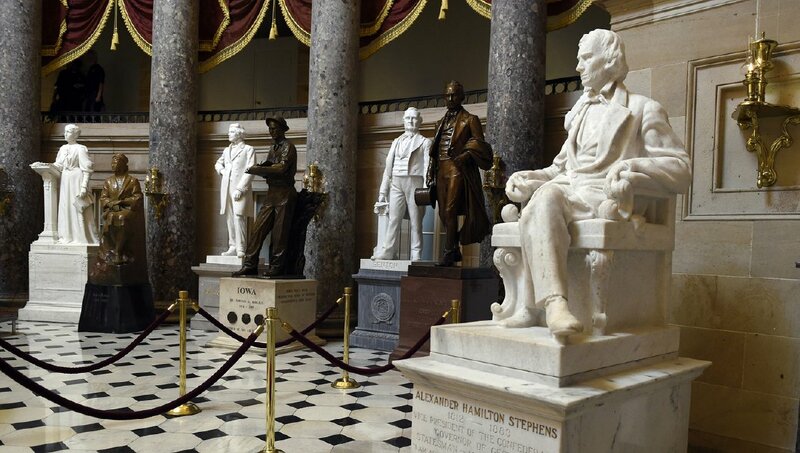 Pelosi released a statement that read in part, “it is time to immediately remove Confederate statues from the halls of Congress.” No, it isn’t. Vice President Mike Pence said Tuesday that states should decide whether to remove their Confederate statues from the U.S. Capitol, and said he believes more monuments should be built to celebrate those who have helped the U.S. progress. “What we have to walk away from is the desire by some to erase parts of our history just in the name of some contemporary political cause,” he said. During his interview with Fox News, Pence said he believes removal of statues should be a “local decision,” but said the nation should be celebrating the “progress” the U.S. has made. “We ought to remember our history, but we also ought to celebrate the progress we’ve made since that history,” Pence said. Pelosi called for House Speaker Paul Ryan, R-WI, to work with Democrats in removing Confederate monuments from the U.S. Capitol. But each state chooses which statues to send to the Capitol. So, that’s really not her call or Paul Ryan’s to make. She’s looking to score cheap political points here and she’s groveling as usual trying to be politically correct. Pence continued his rationale… “Rather than tearing down monuments that have graced our cities all across this country for years, we ought to be building more monuments. We ought to be celebrating the men and women who have helped our nation move toward a more perfect union and tell the whole story of America,” he said. Exactly… the good, the bad and the inbetween. You don’t just get to keep the pieces of history you like. The left decries fascism and is instead practicing it themselves by trying to rewrite history. Pence hit this one out of the park. Good for him.